OKLAHOMA CITY — The Oklahoma Capitol Preservation Commission has unanimously voted to place a temporary ban on new monuments at the state capitol building following requests from several groups to erect displays next to a Ten Commandments monument. As previously reported, the monument at issue was proposed and paid for in 2009 by Republican Representative Mike Ritze, and was soon after approved by the largely Republican-run state legislature. The six-foot display was erected last year, but the ACLU said that the monument was unconstitutional. “By accepting our offer, the good people of Oklahoma City will have the opportunity to show that they espouse the basic freedoms spelled out in the Constitution. We imagine that the ACLU would also embrace such a response,” stated spokesperson Lucien Greaves in a news release about the monument. The Universalist Society of Hinduism soon afterward issued a release, outlining its intent to likewise request permission to place a statue of the Hindu monkey king Hanuman near the Ten Commandments monument. People for the Ethical Treatment of Animals (PETA) then also advised that it also wanted a display at the capital building. 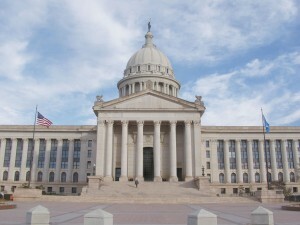 But on Thursday, the Oklahoma Capitol Preservation Commission voted unanimously to ban any new monuments from being erected on the Capitol grounds until the ACLU lawsuit has run its course. It has not issued a public statement about the matter. The Liberty Institute, a Christian legal organization in Plano, Texas, is defending the Ten Commandments monument alongside Oklahoma Attorney General Scott Pruitt. The case is called Prescott v. Oklahoma, bearing the name of the Baptist minister who objects to the monument’s presence on the Capitol grounds.